Another symptom of our desire to "have it all" is the concept of an untouched, totally natural forest. On top of all the demands, created by growing populations, we want the forest to be "as if no one has ever tread in it." People expect a place with only nature in the driver's seat. Well, this is yet another unrealistic demand. Humans are here and have made a mark, like it or not. We have little choice except to carefully manage the forests. 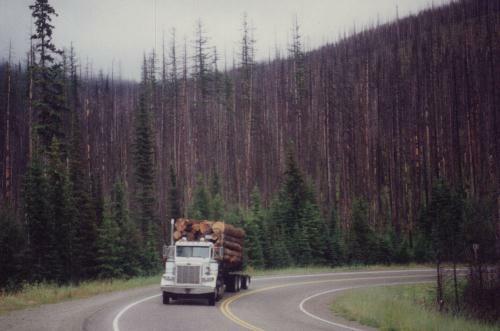 Forest fire damage near Sherman Pass in state of Washington. Photos taken 1995. More photos below. Several years back, the concept of "let burn" was tried. In a totally pristine environment, there is no one around to fight fire. Burning was part of nature's balance for thinning and restoring forest lands. The problem is, we have already upset the apple cart. Turning back now is problematic. Years of forest management and fire suppression has allowed undergrowth to come in so thick that today's fires are far more devastating than before. If we let it burn now, with that amount of fuel accumulated, it destroys everything. Turns the woods into a crematorium. Even allows the top soils to wash away. Going back to the natural state, where fire was part of the balance, can not be accomplished over night. Maybe it could take place, in some areas, after going through several transitional steps. We can't expect to "have it all." Our growing population, rural housing developments, demands for forest products and a totally untouched environment can not all be had at once. It isn't like the remote control on a television where that push of a button can bring the world. "Remote control land" is a strange place. It is a world where public school teachers can expect pay raises while taxes are lowered. It's a land where houses can be bought for $18,000 and then sold, a few years later, for $800,000; with out any increase in property taxes. So it goes to follow that remote control land would be a place where one can visit a totally pristine and natural forest with out having to leave the freeway! Many people expect too much. It must be the force of greed. That force was blamed for the excessive logging practices of past eras that clear cut much of the forest. Today, the other side of the greed coin is expecting a totally natural forest; thus pushing the blades of our bulldozers out of sight while populations keep growing and consuming. In some cases these blades end up in third world countries. In other cases they work the vast tree farms of south eastern states. Actually, tree farms of the American south east, where trees are planted like row crops, may not be a bad thing. It can be a renewable resource. Here in the west, timber production is likely to be less important than in the tree farms of the south, but it is still part of the picture. It is part of the balance along with recreation and preservation.